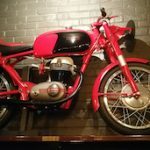 Food, Wine, and… Motorcycles? Cafe Veloce Delivers All Three! Wedged between an auto parts store and Yuppie Pawn, this local Italian joint looks a little dubious from the outside. And in a metro area dominated by the likes of nationally-known restaurateurs Tom Douglas and Jonathan Sundstrom, it’s easy to see how a homey spot like this gets overlooked. All Rights Reserved. Protected by copyright laws of the United States and international treaties. This content may only be used pursuant to the subscription agreement and any reproduction, copying, or redistribution (electronic or otherwise including on the world wide web), in whole or in part, is strictly prohibited without the express written permission of Great Escape Publishing, 101 SE 6th Ave, Suite A Delray Beach, FL 33483.